Details: Check out the Velopalooza calendar of rides. While the Velopalooza Festival itself is finished for this year, the calendar of rides is still active! Their Facebook page is also updated on a regular basis so keep in touch! Mountain View Cemetery, 5445 Fraser St at 39th Ave.
Join us for a day of walking tours, and even a bicycle tour! Explore the history, people and events that have shaped Mountain View Cemetery as we celebrate our 125th birthday.Hear about the intrigue of our supposed first burial and what really happened to Simon Hirschberg…Bring a picnic and enjoy our 106 acres of green space and spectacular views of the city and mountains. Velopalooza…two weeks of bike fun! 7:00pm, Meet by 7pm we ride by 8 pm sharp! Join us for a family friendly bike ride through Mount Pleasant!Meet at 10:30 AM at Robson Park for prizes, songs and fun. We’ll depart at 11 AM on a short ride (approx 30 minutes) and return to the park for a brown bag lunch (so be sure to pack one! ).Donations will be accepted for the Mount Pleasant Family Place, so bring your toonies! Cover your bike with lights and come on out to the second annual Bike Rave. A Ride at the Opera invites you to a leisurely ramble through the east end to Hastings Park. Fun, frolic, picnic and classical favourites to follow. Falstaff, Rigoletto and other surprise faces will appear. Popular aria karaoke with live accompaniment by the East Vancouver Symphony Orchestra and the New Brighton Singers. Musical program may be subject to change. Post picnic ride to Bike Rave 2.0 or bus bailout available nearby. Fifteen minute ride to nearest skytrain station. Come on out to Car Free Day and celebrate bikes! MAIN ST.: Velopalooza will be there with a pedal zoo (come try out some crazy bikes) and the Community Policing Office will have a bike rodeo for the kids. COMMERCIAL DR.: Velopalooza will be there with a pedal zoo (come try out some crazy bikes) and other bike fun TBA. Details: Velopalooza Kickoff Party at the Waldorf with the Gastown Sprints, and an amazing music line up to be announced. Arrive by bike and you will have the chance to win a prize! Valet Bike Parking. Cost: Free! They’ll give you stuff! Details: Various events and commuter stations will be set up to offer cyclists all sorts of goodies—draw prizes, hand-outs, snacks, free mechanical services, etc.. There is also a commuter challenge to encourage your co-workers and other businesses to see who can clock the most kms. Details: This is your last chance to get your bike nice and shiny and working well before Velopalooza 2011! We’ll wash and lube your bike, plus give it a thorough mechanical inspection. If you’re really feeling generous, we can take care of minor tune-ups as well. Service is by donation in support of Velopalooza. Details: Bike pilgrimage along Still Creek and the Central Valley Greenway to Burnaby. Installations, art music, dance, tea and treats under the Kensington overpass just west of Sperling Skytrain station. Meet at Renfrew Skytrain Station at 11:00 (ride leaves at noon). More information: community.spiritfish@gmail.com or check out the website. Details: Riding4Ridings is looking to team up with local artists, citizen groups and environmental non-profits to develop a community-based project that transports people on election day to the appropriate polling station by a fleet of borrowed, lent, homemade, created and customized passenger and trailer BICYCLES! Time: Meet under the cherry trees at Devonian Park (Georgia at Denman) at 11am. Cost: Free. Fundraiser bike washes at Union Market and Wilder Snail starting at 11:00am. 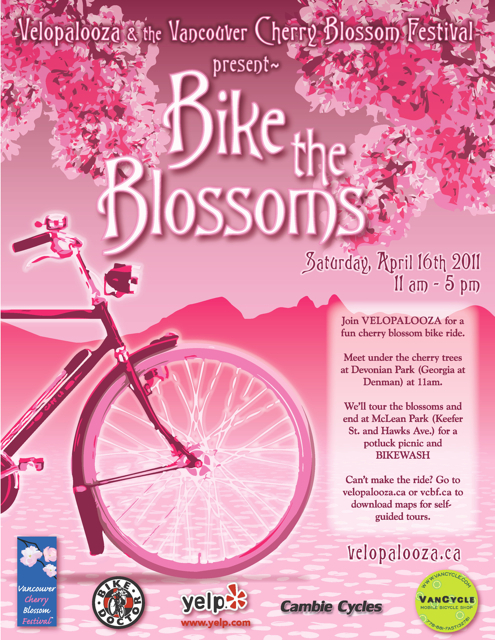 Details: Velopalooza.ca and The Vancouver Cherry Blossom Festival (vcbf.ca) present BIKE the BLOSSOMS. Join Velopalooza for a fun cherry blossom bike ride. We’ll tour the blossoms and end at McLean Park (Keefer St. and Hawks Ave.) for a potluck picnic and BIKEWASH. VanCycle will be on hand to look at your bike and provide free mechanical services! Bring some food to eat and share at McLean Park. The Wilder Snail and The Union Street Market are right there to pick up something too. We will also have the BBQ trike there. More information: More details to come soon. Details: Is your bike covered in winter muck and mud? Got squeaks and creaks? Want someone else to deal with it? Come on out to the Velopalooza bike wash and let us give your velo some love. We’ll wash and lube your bike, plus give it a thorough mechanical inspection. If you’re really feeling generous, we can take care of minor tune-ups as well. This event is rain or shine (we’ll set up a tent!) and all work is done by donation in support of Velopalooza. VanCycle will be there to look at your bike, do some minor repairs and adjustments, and chat about your bike. Time: Doors at 8pm. Music starts at 9pm. Cost: Tickets are $12 in advance and $15 at the door. VanCycle has a limited number of tickets available…give us a call or e-mail. Details: Come on out and support bike fun!